We expected to be awoken by the morning call to prayer, but instead it was the cries of seagulls wheeling above the old town of Istanbul that brought us awake this morning. 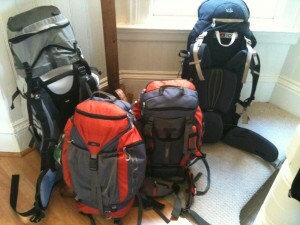 We all managed around 12 hours sleep and felt much the better for it. The Blue Mosque is ‘only’ 400 years old, but it has the distinct advantage that it was built specifically to be overwhelming and awe-inspiring. The scale of the undertaking was controversial at the time and it’s an indication of the ambition involved that when the sultan was criticised for his arrogance in building a mosque with six minarets, a number which equalled that of the main mosque in Mecca, he solved the problem by adding another minaret onto the Mecca mosque rather than changing the design in Istanbul. After buying Jennifer a head-scarf, we joined the queue snaking its way into the Blue Mosque. We spent some time contemplating why the interior of a mosque feels different to the interior of a cathedral. The conclusion we came to is that mosques tend to focus on a light-filled open-plan space while cathedrals tend towards little chapels, small windows, and lots of smoke. 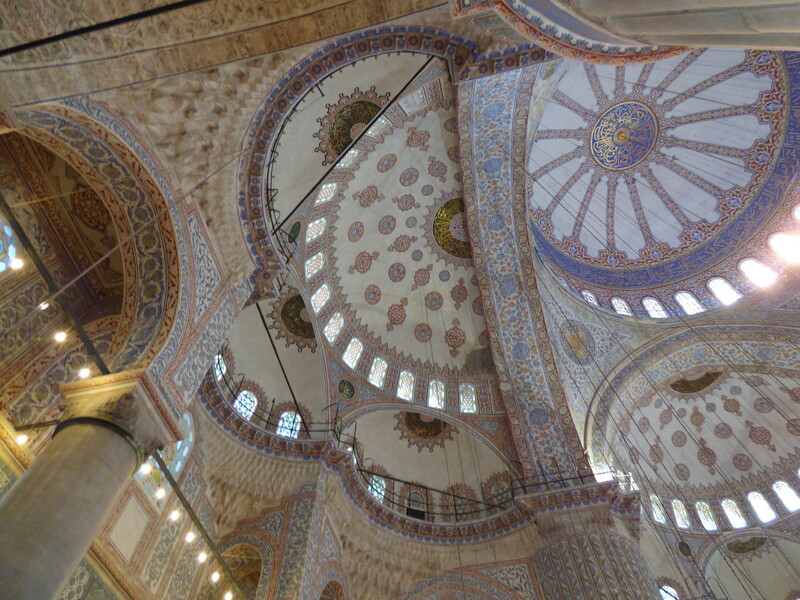 Certainly the interior of the Blue Mosque revolves around light and sweeping curves and is absolutely lovely. 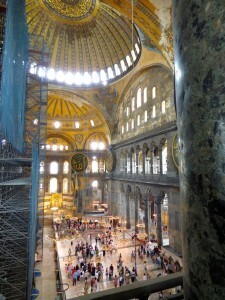 In some contrast, the Aya Sophia which stands opposite the Blue Mosque was built as a cathedral and for over 1000 years it was the largest cathedral in the World. It was built 1600 years ago by the Emperor Justinian and then when Istanbul fell to the Ottomans in the 1400s it was converted to a mosque. Luckily the rulers at the time were of quite refined tastes and rather than destroying anything, they simply painted over the bits that offended the building’s new purpose. 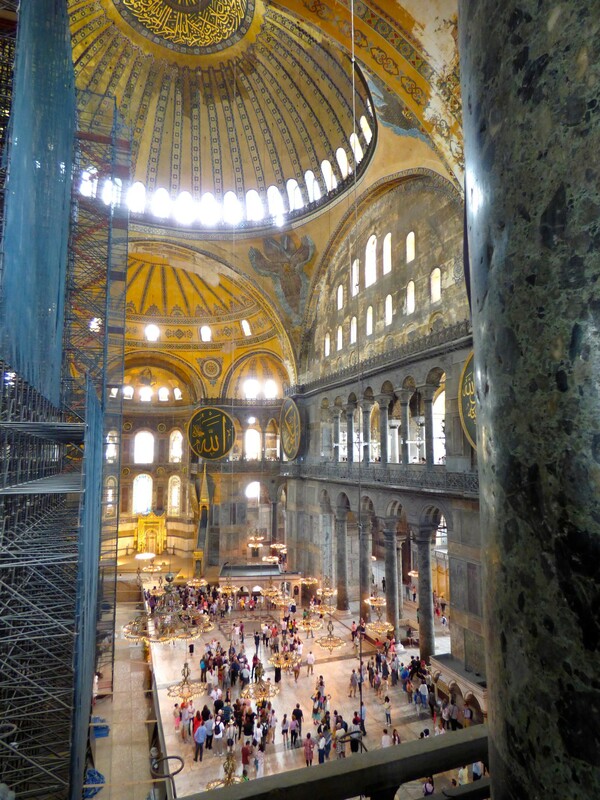 As a result the Aya Sophia, which is now a museum, combines Islamic patterns with stunning Christian mosaics. One of the best things in the Aya Sophia, once you get past the extremities of age and size is the odd little bits of history. One of the marble balustrades that surround the galleries has a bit of graffiti scratched into it by a viking mercenary in the year 900. As it was a lovely day and we were getting over queues and crowds we sat in the gardens and ate Turkish simit which we’d bought from one of the ubiquitous street sellers. Istanbul is absolutely filled with little three-wheeled carts each selling one of corn on the cob, roasted chestnuts, or simit. 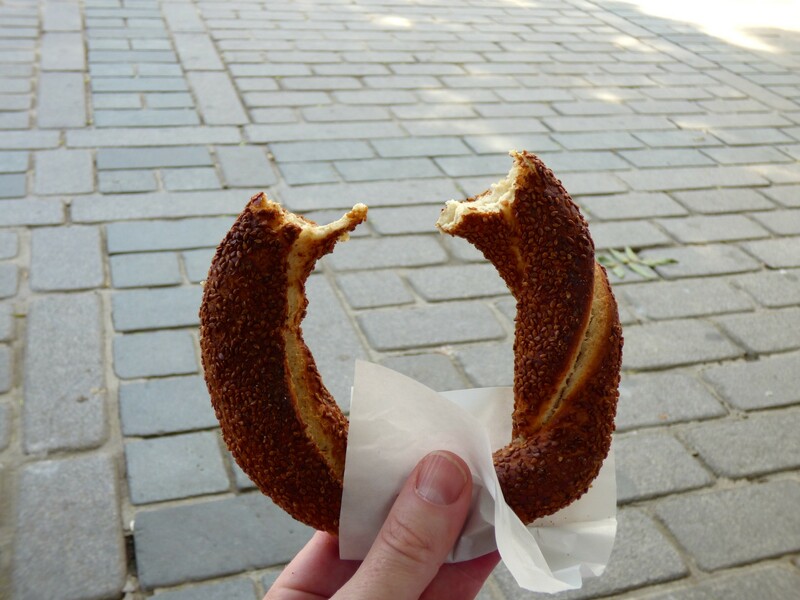 Simit is like a Turkish bagel although a bit fluffier and covered with sesame seeds. Baked with some cheese it’s delicious; with chocolate, as the boys discovered, it’s too much. After a bit of recovery time back at the hotel, we caught the tram over to the other side of the Golden Horn and then a funicular up to Taksim Square which is remarkable only for being the site of Turkish anti-government protests. No one was protesting today though but the square and surrounding pedestrian streets were filled with tourists and local shoppers. We walked down the ridge of the hill, through Istanbul’s main shopping street, back towards the water and the Galata Tower. The Tower was built by the Genoese in 1348 and it dominates the Northern shore of the Horn and affords an amazing 360-degree view of Istanbul from a tiny vertigo-inducing walkway near its top. I must admit we were all getting a bit tired by this point and we then spent a frustrating time tangled up in small side-streets and then a series of big roads with under-passes making our way back to the bridge over the Golden Horn. On the far shore we decided to walk home via the spice markets which proved very disappointing. Once it was a genuine centre for the locals to find spices, now it seems to be a tourist trap and little else. So we made our way through it at speed. Luckily there was a far more interesting stretch of small, winding streets that took us back to the hotel in the fast-cooling evening and to the accompaniment of the evening call to prayer echoing off the surrounding walls. Courtyard of the Blue Mosque. Mosaic of Justininian holding the Aya Sophia. Old Istanbul from the Galata Tower. Sponges in the Spice Markets.